March Madness for 2013 Louisville home sales! College Basketball is not the only thing on the minds of many in Louisville in March! Buying a Louisville home also ranks right up there. 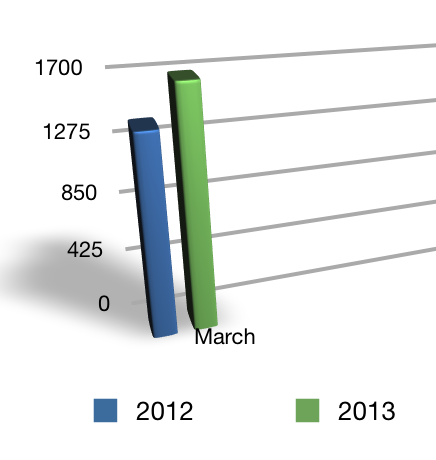 The number of homes going under contract in March 2013 skyrocketed when compared to just one year ago. Louisville experienced a 20.31 percent increase in homes going under contract. The number of homes sold and closed last month also increased when compared to 2012 by 15.66 percent. With the average selling price up $8000 and the average median price up $5000 over March 2012, the numbers are encouraging for any Louisville homeowner thinking about putting their home on the market. Add to that a major increase in buyer activity and the number of homes on the market, (6,351 as of this blog post) and you have a formula that could see a shortage of Louisville homes to sell in the near future. Many sellers may be sitting on the sidelines waiting for home prices to increase or a sign that the housing debacle of past years has officially passed. Slowly the news media is picking up on the fact that home sales have picked up. There have been a number of national stories on the increase of home sales, and Louisville’s Courier-Journal has reported one or two stories about an increase in local sales. But it’s far from being enough. Were constantly talking to potential sellers who have no clue where the market is and where it’s going.